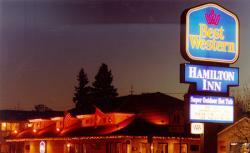 Best Western Hamilton Inn is located 45 minutes south of Missoula, Montana in the beautiful Bitterroot Valley. Mountain vistas spread before your eyes with all the activities such as premium fly fishing, golfing, hiking and biking. In the winter, skiing and snowmobiling are the big attraction. The historical Marcus Daly Mansion, Ravalli County Museum, St. Mary Mission and Fort Owen Museum and Ranch are here to tour. We are located in the center of town, within three short walking blocks. All the best restaurants are close by. The Today show and Good Morning America have rated us as the best rural area in the Rocky Mountain region to live in. It's just perfect! Directions: The Best Western Hamilton Inn is easy to find. It is located in the center of town just south of Main Street on Highway 93 South. We are 50 miles south of Missoula, Montana.